It is time for a party. And we truly need it. The year is almost over, the cosy winter solstice is right ahead and with the brighter days afterwards it just seems likely to dedicate a feast to life itself. To sitting together, to laughing, and – because what would a good party be without it, eh? – a lovely and highly enjoyable meal. Today a little less traditional and far from goose and Christmas duck; these delicious roasts I want to attend to without traditions implying it to me, even if they may ask for it all so quietly. 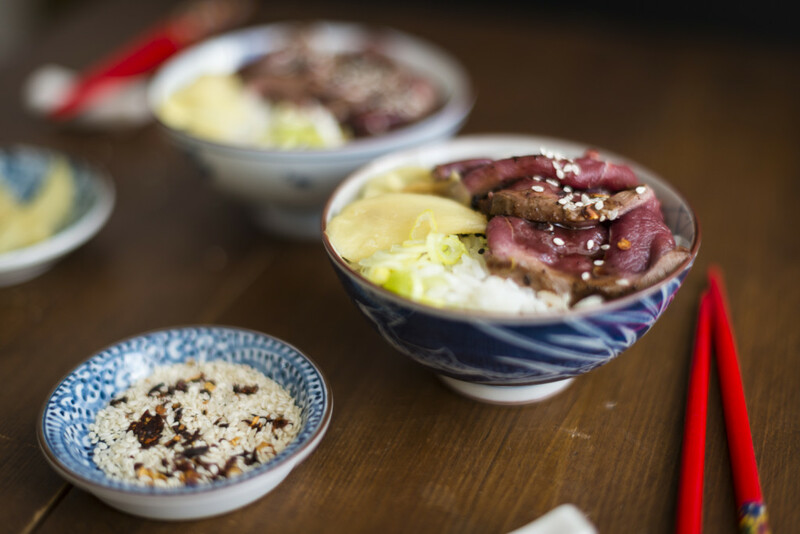 Let’s just have a look at the rest of the culinary season and discover venison. Beautiful and gorgeous in its dark, and almost purplish-coloured, red tone and spicy in its very own and special way it is quite a good fit for such a feast. And it even goes well with the Southeast Asian flavours, that I adore so much. Simply marinated, sizzled in a generous amount of good butter (because especially on Christmas we please do not want to start skimping on that one!) and finally served on perfumy, steaming rice along some gari, spring onions, sesame and a fine sauce it truly is a delight. And it is my contribution to Zorra’s eleventh culinary Advent calendar. Let the venison adapt to room temperature first, then wash it and pat it dry. Heat up the tbsp butter in an pan on medium to high heat. As soon as it foams and starts to turn brown, add the meat and fry it shortly on each side, all the way around. Let it fry for 1-3 more minutes so it still will be at least medium rare in the middle. Mix soy sauce, sake, mirin and wasabi and pour in into the pan. Switch heat down to medium and let it cook down a bit. Add the rest of the butter and let it melt in the sauce. Turn over the meat in the pan so it will be covered with the sauce, that should have thickened by now, and put the pan off the stove. Get out the meat and let it rest for a minute. Meanwhile chop the spring onions into rings and divide the freshly steamed rice onto two bowls. 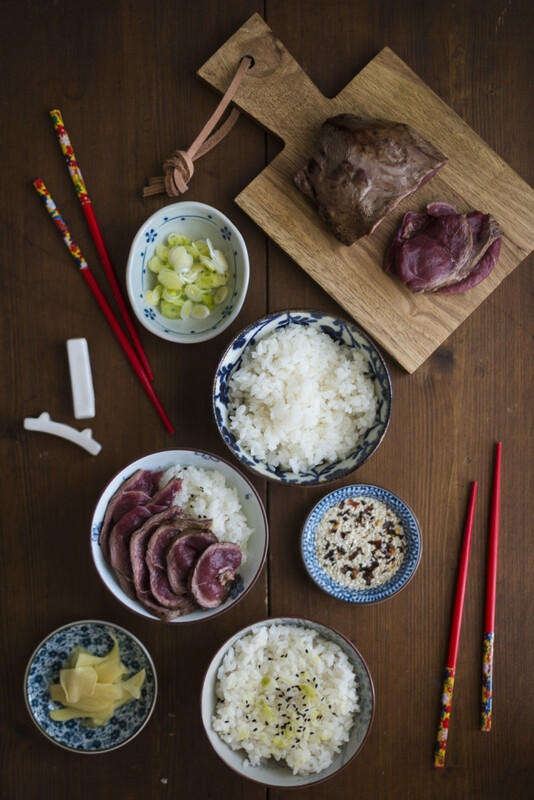 Cut the venison into thin slices and arrange them on the rice, adding the gari, the onions and some sesame for garnish. Pour the sauce over it and enjoy.